Many flocked the streets of downtown Portland, disrupting rush hour traffic with a peaceful rally. 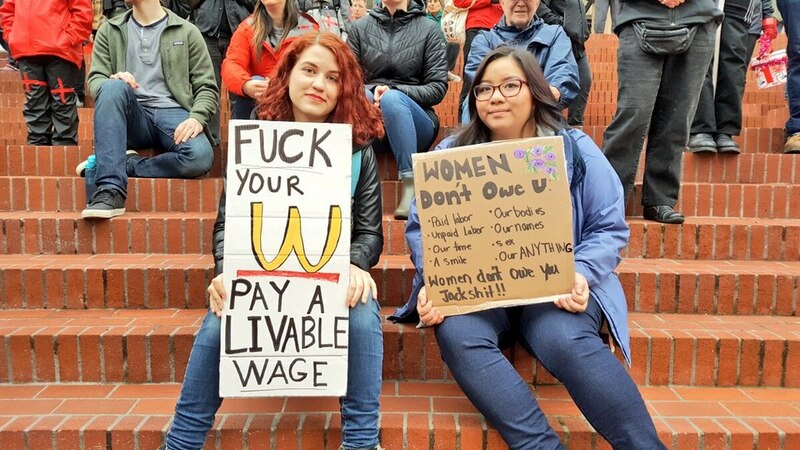 Portland State alumni Mackenzie Hilmes and Portland State student Kylie Nelson held signs during the rally. 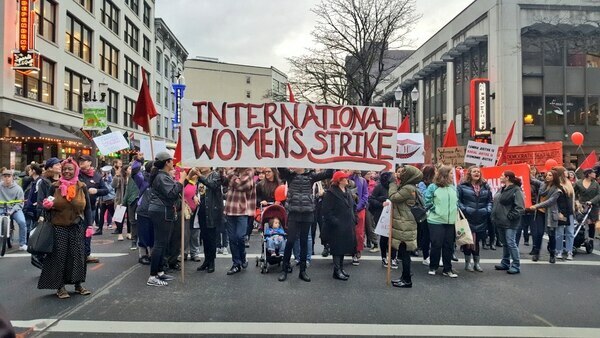 Portlanders celebrated International Women’s Day in a distinctive manner: marching in the downtown streets in rush-hour traffic. 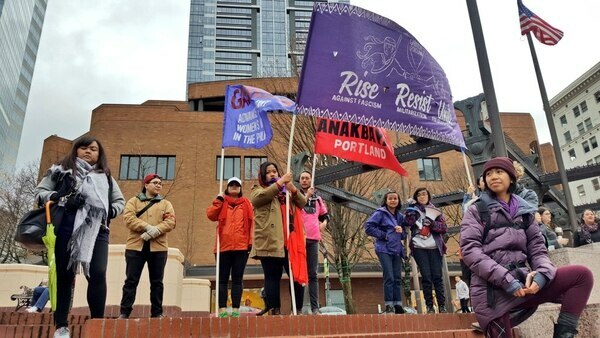 More than two hundred students, teachers, business owners and workers gathered in Pioneer Courthouse Square Thursday evening for the International Women’s Strike march. The march, designed to protest gender inequality, was organized by the activist group Don’t Shoot Portland. Speakers talked about women’s pay, immigration, tokenism, healthcare and sexual harassment in the workplace. The strongest message at the event? Equality must benefit all women, or it’s not good enough. One of the head organizers, Olivia Pace, warned that women who aren’t willing to support other social-justice fights shouldn’t attend. That message extended to the dress code. Owner of Revolucion cafe Maria Garcia, who is running for Multnomah County Commissioner in District 2, gave a rousing speech about being an immigrant. The march began in Pioneer Courthouse Square and looped around downtown ending at the waterfront. GABRIELA Portland, an advocacy group fighting for women’s rights in the Philippines, took the rear—saying the gesture symbolized making sure no one is left behind. GABRIELA Portland took the rear of the march at the International Women’s Strike. The marchers also stopped in several intersections to disrupt the flow of traffic. One was at the intersection of Southwest Oak Street and Broadway, where they stayed silent for 4.5 minutes to commemorate the time Michael Brown, who was shot by a police officer, was left lying on the streets of St. Louis, Mo. Rachel Ramirez is a student at the University of Portland. 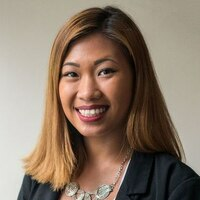 She calls the Marianas Islands her home and moved to Portland to get a degree in communications with a focus on journalism.